I discovered my mistake. I should have pointed the arrow down to go to another room where the sink is. I should have read the walk through a bit more carefully. I realize that the walk through changes depending on each individual's process in going through the game. I find myself stuck again. I need the grater to make flake soap. I also can't find a way to fill the bucket with water and the handle that operates the washing machine. I checked the walk through but I am not able to get the grater. The walkthrough stays the same but you can choose to do certain events in different orders. 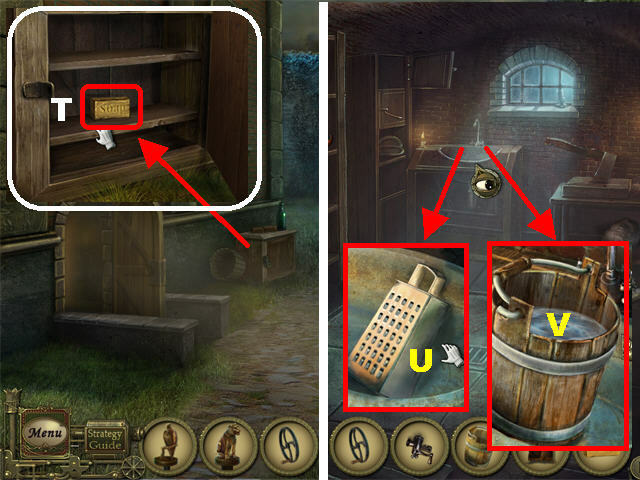 The grater is found in the sink in the lab, when you head to the room on the right. This is also where you will fill your bucket of water. The screenshot here will give you a better idea of what the room looks like. I did contact customer support and got an incident ticket. Funny thing is they never got back to me. Go figure. I even tried deleting and reinstalling the game. Seemed like it was worse. I don't recommend purchasing this game. All the other ones worked fine. I been trying to play the trail run of the game, and the game keeps kicking me off to where it says I have 55 seconds to play..I like the game so far but don`t want to buy the game if this will happen all through the game.. any patches for this game? You'll be there forever if you keep doing that. There are two separate operations, some time apart. It will be a while before you can push the key onto the newspaper. That depends on what you have in your inventory. What do you have? alicestorm wrote: I been trying to play the trail run of the game, and the game keeps kicking me off to where it says I have 55 seconds to play..I like the game so far but don`t want to buy the game if this will happen all through the game.. any patches for this game? There is something wrong with the trial. As it's a sample version it shouldn't have a timer at all. The full game is fine though. 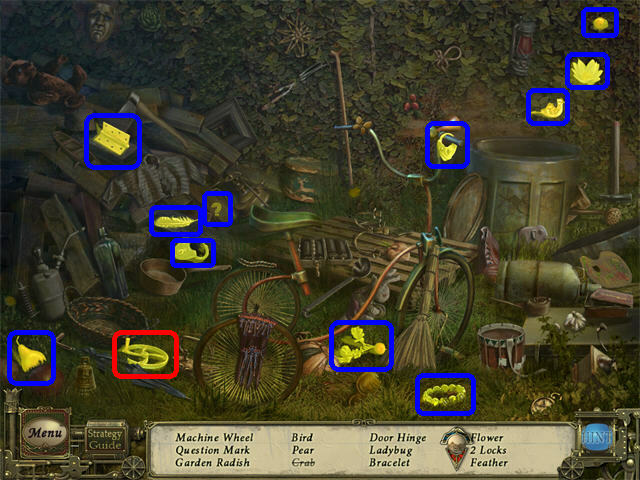 In Chapter 6, we are to put the maget atop the glass jar to retrieve a gear. I cannot get the maget to actually retrieve the gear. What am I doing wrong? genuine1234 wrote: I am stuck at the coach. I cannot get the bar to work on the door nor the statue. Advice? Thanks. Tria4564 wrote: In Chapter 6, we are to put the maget atop the glass jar to retrieve a gear. I cannot get the maget to actually retrieve the gear. What am I doing wrong? once you have the magnet o top of the jar, using your mouse move it down to the gear, and then release the mouse button, it should then attach to the gear and pull to top of jar. can anyone help me with this game? i am @ the part where i need something to get up to the top of the fountain in the garden to clean the moss. I have the string from the violin on the table & the brush on the table but i need a handle to attach to the brush. I also need a handle for the organ. Thank You. foryoutaz wrote: can anyone help me with this game? i am @ the part where i need something to get up to the top of the fountain in the garden to clean the moss. I have the string from the violin on the table & the brush on the table but i need a handle to attach to the brush. I also need a handle for the organ. Thank You. You will need a working wind-up organ. Look closely. Hi, I'm stuck in Chapter 4. I've separated the file blade and am trying to pick up the cloth to wrap around it to protect my hands. However, the cursor changes into a hand, but won't pick up the cloth. I've done everything else in the game up to this point, but now I'm stuck. Is there a problem with my game, that it won't let me pick up the cloth? I've tried MULTIPLE times. Thanks! MeMakeswaves wrote: Hi, I'm stuck in Chapter 4. I've separated the file blade and am trying to pick up the cloth to wrap around it to protect my hands. However, the cursor changes into a hand, but won't pick up the cloth. I've done everything else in the game up to this point, but now I'm stuck. Is there a problem with my game, that it won't let me pick up the cloth? I've tried MULTIPLE times. Thanks! For anyone else stuck at this point, you don't pick it up. Drag and drop. I know I need a mouse (have cage and cheese) and I know I need to move the carriage (I have steel bar, rapier and fireworks). But how do I work them? Where is the door handle? Where is the mouse? Where do I put the two keys I have (eagle lion) and where do I find a tiger key? I am so stuck, any answer to any one of these questions would be so helpful. Wow, that's quite a few queries, have you tried checking out the complete walkthrough here by any chance ? You can find the answers you need and some handy screenshots too! And if you're still finding it hard to complete some sections of the game, just post in here and the fishies will be happy to assist you . I was gifted Black Cat but I can't download. It says something about my C:drive being external or not connected. What do I do?